A really unique feature, a business class lounge designed for travellers once they arrive into a destination. Not checking in to your hotel till 2pm but arrive from Asia/USA in the morning? Or perhaps you want to freshen up and have your clothes pressed before an important meeting? You can access the lounge until 1pm each day. 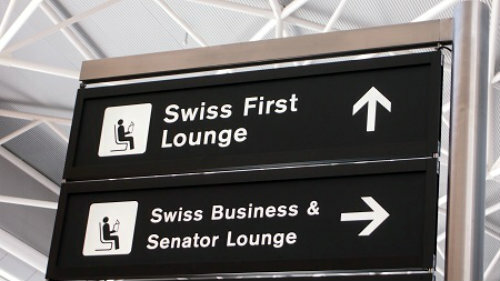 Access: Swiss and Lufthansa First Class passengers, Swiss Business Class passengers, Hon Circle members, Miles & More Senator and Frequent Traveller members. 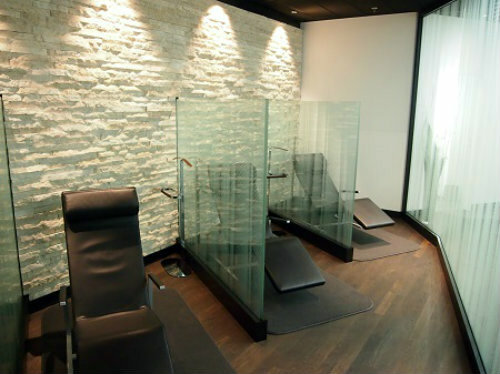 Lufthansa Business Class passengers can access this lounge when arriving on a long haul flight via Dusseldorf, Munich or Frankfurt. The Swiss Arrival Lounge is quiet and spacious at over 700 sq m.
Twenty showers are available (one equipped for the disabled) with bathroom towels, hair dryers and a wide variety of toiletries. 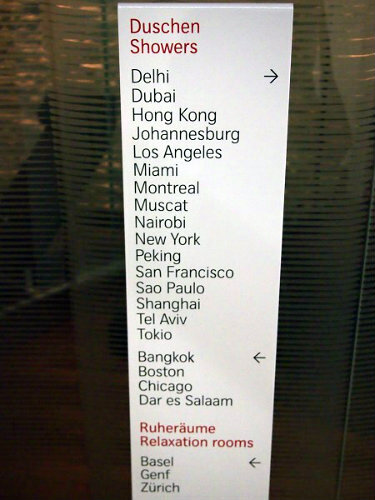 Each shower and rest area has it’s own name based on SWISS’ destinations. Work areas with laptop outlets and ten desktop PC’s all with fast free Wi-Fi, printer, fax, paper shredder, meeting room, private phone cubicles and telephones (local calls are free) are all available. Three private bedrooms, one with a private bathroom. 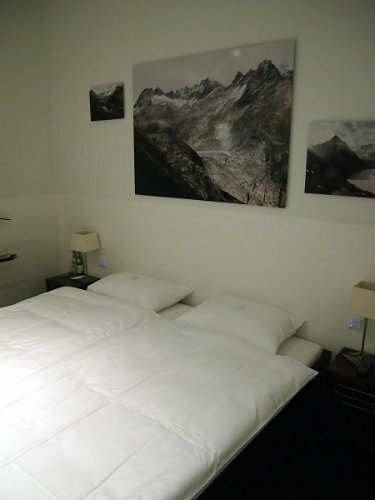 1 x double room, 2 x single rooms on a first come first served basis. Reception offers assistance with hotel bookings, connecting flights, train connections or other arrangements. Quiet areas to relax. Ironing service, place your clothes in the 2 way cupboard on the bathroom door whilst you shower and the SWISS staff will press them whilst you refresh. Access: Swiss, Lufthansa and Star Alliance First Class passengers, Swiss, Lufthansa and Star Alliance Business Class passengers, Hon Circle members, Miles & More Senator and Frequent Traveller members, Star Alliance Gold members. Selection of hot and cold snacks and fresh fruit at the buffet. Wide selection of drinks. Furthermore, drinks and snacks can be ordered at the waiter service bar area with informal atmosphere and the longest lounge bar in the airline world (28.6m) offering fantastic views of airport operations. Ten work stations with free internet access, although sometimes rather slow. Limited selection of newspapers and magazines. Television. Sony Playstation. Reception area (hotel-style) with lounge and concierge service, large smoking section in the bar area. 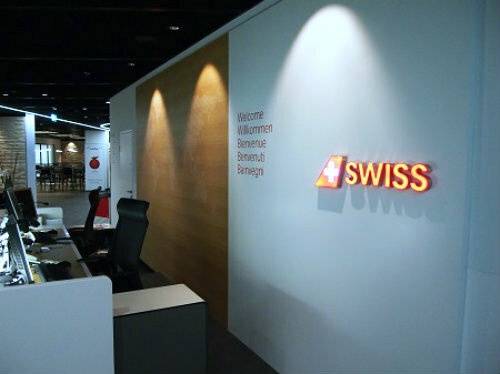 Access: Swiss and Lufthansa First Class passengers, Hon Circle members. Comfortable and quiet lounge, perfect for getting away from the general airport hustle. Outstanding service from lounge staff. Full bar. Large buffet with hot and cold snacks. A la carte restaurant with snacks menu from 10:30am and pre-flight dinner available from 6pm. Three showers with Bvlgari amenities. Business Centre with three workstations equipped with Sony laptops & printers, work spaces with power sockets compatible with GB, DE & US, internet access and meeting rooms. TV Room. Local and international newspapers and magazines. Library. Two day rooms available with ensuite. Shuttle service to your departing flight. 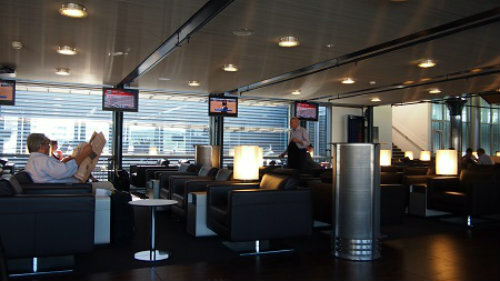 Location: Airside – the lounge is in the non-Schengen area, D section. Access: Swiss, Lufthansa and Star Alliance First Class passengers, Hon Circle members, Miles & More Senator members, Star Alliance Gold members. Accompanying children under the age of six are admitted free, disabled access available. Nice new lounge with 84 seats on 265 sq m. Large window fronts with views of the airfield. Full bar. A nice variety of hot & cold food is available on the generous buffet. Business Centre with 14 HP PCs, printer, fax and internet access. Six work stations with GB, DE, US and Europe plugs. Free Wi-Fi. Local and international newspapers and magazines. Television. Location: Airside – the lounge is located on the second floor of the Airside Centre, entrance is on the left side of the reception desk. Access: Swiss, Lufthansa and Star Alliance First Class passengers, Hon Circle members, Miles & More Senator members, Star Alliance Gold members. Spacious lounge spread over two floors, partly the old First Class lounge. A nice variety of beverages and hot & cold food is available. Upstairs on the right there is a Movenpick ice cream bar. Working area with eight PCs, b/w printer, fax and internet access. Work stations with GB, US & DE compatible power sockets. Free internet access. Local and international newspapers and magazines. Television. Location: Airside – after clearing Boarding Pass Control at Check-in 1 or Check-in 2, turn left towards the B-Gates and follow signs to ‘Lounges’. Access: First & Business Class passengers of various airlines, Priority Pass members and Diners Club card holders. Admission fee is CHF38 (AUD$57). Children under the age of twelve are not admitted. Disabled access available. Four computers with internet access. WLAN free for some airline/airport sites. Some German magazines and major German and international newspapers. Large screen TV tuned to news channels. Telephone calls, may be subject to payment. Fax machine available. Location: Airside – E Gates. After security checks, take the elevator or stairs from the second floor departure level to the third floor. Follow signs to the lounge which is located above Gate E45. Access: First Class and Business Class passengers, Priority Pass members and frequent flyers of various airlines. Admission Fee CHF35 (AUD$52) valid for one year. Limited to four guests per cardholder. Children under the age of six are admitted free. Disabled access available. Spacious lounge with an impressive view over the runways. Over 150 seats in 480 sq m. Decorated with panoramic pictures by photographer Derrick Feole. Full bar, hot meals, cold snacks and fruit. Bistro area with tables for two and four. Work with your own laptop or use one of five laptops provided by Panorama at no cost for an unlimited time. All major German and international newspapers and magazines. Large screen TVs tuned to news channels, but remote control available to all. Fax machine available. Air Conditioning. Reception Desk happy to provide flight information or any other clarification necessary for your trip.